If your work requires you to be constantly on the move and you need access to your email messages, Outlook 2010 provides features that allow you to access your email using your mobile phone. To activate this functionality, you need to register an Outlook Mobile Service account in Outlook 2010. Once you register a mobile service provider on payment of a certain fee for the SMS service, you can send and receive email messages to and from your mobile phone. Additionally, you can forward messages, calendar entries, and reminders from Outlook 2010 to your mobile phone. 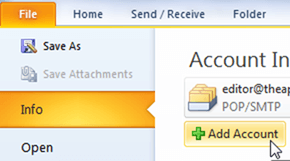 In this post, I will explain how to add a Mobile Service Provider in Outlook. 1. Select the File tab and click Add Account. 2. In the Add New Account dialog box, select Text Messaging (SMS) and click Next. 3. In the Outlook Mobile Service Account dialog box, in the Sign up with a text messaging service provider section, click the Find a text messaging service for your mobile operator link. You will be directed to a web page from where you can select and register with a service provider. 4. In the Outlook Mobile Service Account dialog box, in the Fill in account information section, in the Service Provider URL, User ID, and Password text boxes enter the required details. 5. Click Test Account Settings to test the service. 6. In the Microsoft Outlook message box, click Yes to send a test message to your mobile phone. 7. You will receive a test message on your mobile phone and a message box in Outlook confirming the same. Click OK to close the confirmation message. 8. If necessary, click More Settings to rename the mobile account name or configure additional settings in your service provider site and click OK.
9. Click OK to close the Outlook Mobile Service Account dialog box. 10. In the Add New Account dialog box, click Finish. That’s it! You just learned how to add a mobile service provider in Outlook 2010. If you found this tutorial useful, please visit our archives section for more use Outlook tips and tutorials.